The Indian agricultural reality shows that though farmers spend long hours at their field, productivity and economic benefits continue to evade many of the small landholders. A major reason for this is uneven access to available technology. Food security requires a stronger production response. Agricultural extension services and research can help reduce the difference between actual and potential yield. As a model for a new method of agriculture, Rikin Gandhi launched Digital Green after carefully studying agriculture extension services. The Digital Green method recreates the relationship between the agriculture extension worker and the community and creates a new ecosystem of community learning where the community creates, disseminates, and evaluates the information. 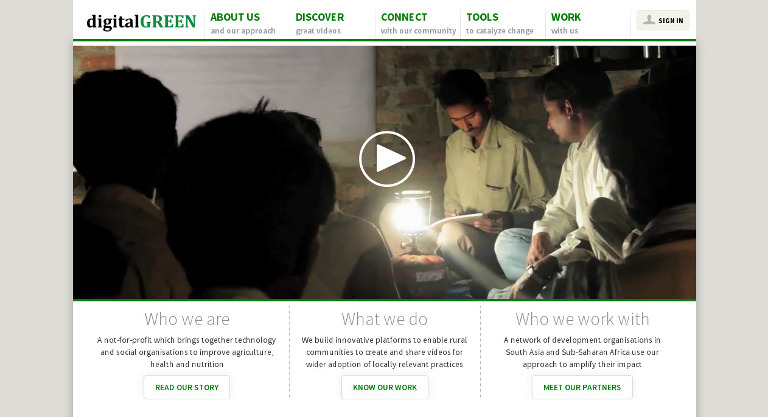 The intervention uses video as a basis for disseminating agriculture practices. The medium in many ways is optimally designed, as it overcomes problems of illiteracy and is an intuitively accessible technology. Cropping patterns, weather patterns and agricultural practices of a particular area are studied and content is created with the help of community members. The videos feature a progressive farmer explaining effective practices that he/she is using to increase yield. Seeing a fellow farmer use a particular method in a context and a language that is familiar creates incentive among other farmers to adopt the practice. The Digital Green team is also developing a management dashboard to see how many screenings a farmer attended, the videos a farmer watched, the kinds of questions asked, practices adopted by him/her, and videos in which they can be featured in the future.